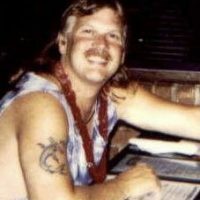 Alan L. Gaskins (Gonzo) passed away at 57 years of age on Friday, January 4th at Obici Hospital. Alan was born on May 4th, 1961 and was a life-long resident of Jolliff Rd in Chesapeake VA. He graduated from Faith Christian School in 1979 and Flagler College, St. Augustine, FL in 1984. He owned Alan Gaskins Tile Company and was well known in the area for his excellent craftsmanship. For over 30 years he gave his all to the business, building a loyal clientele, along with the help of his devoted employees. He was preceded in death by his father Lindsey W. Gaskins and sister Bonnie K. Gaskins. He is survived by his mother, Margaret Gaskins, wife, Gina Nardoianni, daughter Teresa Hogan (Bill Hogan), stepdaughters Amber Smith (Williford Smith, Jr), Sheila Howren (Jerry Cerqua), stepson Jesse Powers, and five grandchildren, Fallon, Khira, Jacob, Thomas and Liv, along with a host of sisters and brother-in-laws, nieces and nephews who all loved him dearly. Alan had a passion for music and was an avid concert goer, with his wife and dance partner by his side. He was also a life-long fan of The Grateful Dead. Among his most prized possessions was his percussion drum collection, and was known to host many late night jam sessions. As a young boy, he spent many summers with his family in Hatteras, NC – a love he never outgrew. He enjoyed fishing, surfing, and wild joyrides in his T-top Camaro. He loved being with his grandkids, who adoring called him “Big Daddy”, camping and making memories around the fire pit. He was a gregarious man who knew no stranger – a friend to all he met. He was loved by many. A funeral service will be held at 4 p,m., Friday, January 11, 2019 in Sturtevant Funeral Home, Portsmouth Blvd. Chapel. The family will receive friends at 3 p.m. one hour prior to the service.